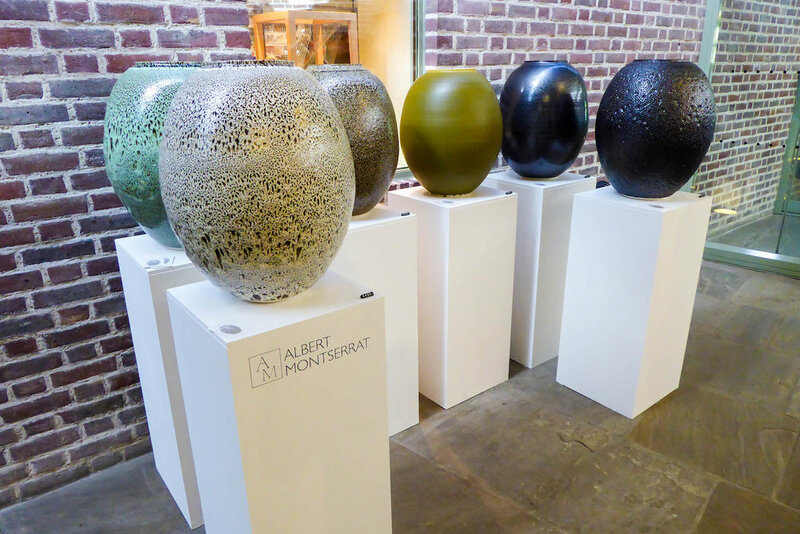 Craft Editions visited Ceramics in the City at the Geffrye Museum on 25th Sept 2016. The Geffrye Museum is a wonderful building in Hoxton, London that explores the home and the way people have lived for over 400 years. Ceramics in the City is an annual celebration of ceramics featuring the work of over 50 potters from across the UK. Here are 5 that stood out to us for their craftsmanship and design. Katharina Klug - Katharina is originally from Austria and is now based in Cambridge, UK. Both her mother and father were potters and Katharina talks about the impact that growing up in her mother’s pottery has had on her chosen career. Katharina works in porcelain on the potter’s wheel and she is inspired by the elemental colour and shape of ancient Korean pottery. Katharina aims to create “timeless vessels for the contemporary interior”. Find out more about Katharina Klug here. Hilary Mayo - Hilary explained to me that while she has a background in TV and radio production, pottery, which is now her full time occupation, has always been her passion. Her work reflects memories and moments that have moved her and includes details in the landscape or buildings that have caught her eye. Hilary’s current work is inspired by the favelas from a recent visit to Rio de Janeiro, where she went to volunteer for the Street Child World Cup. 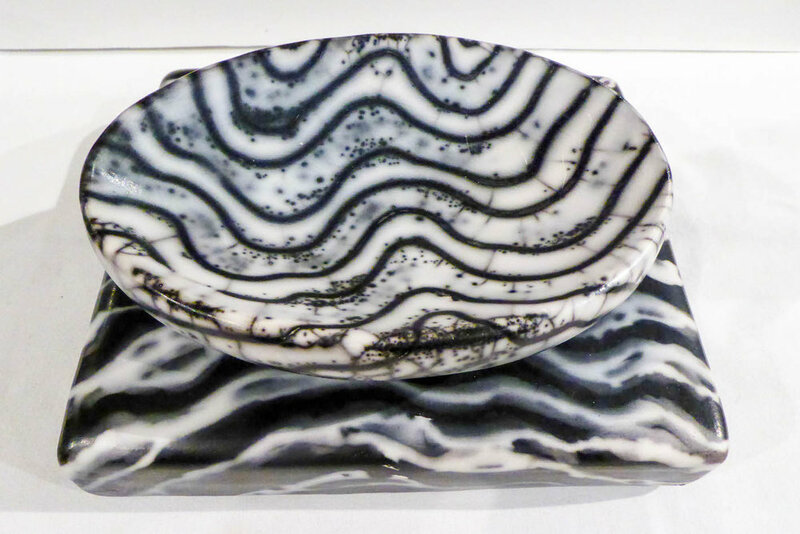 Her striking pieces are hand built using stoneware and porcelain paper clay. Find out more about Hilary Mayo here. 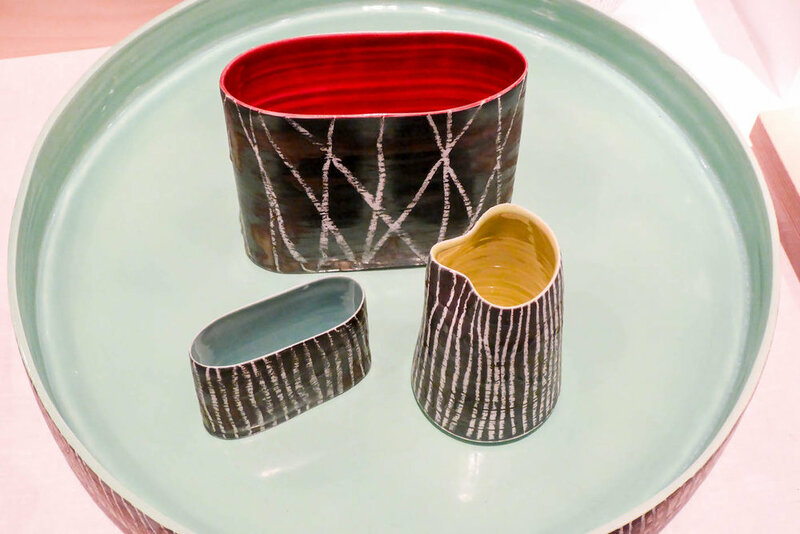 Moyra Stewart - Moyra’s work caught my eye at Ceramics in the City for its bold and dramatically patterned surface decoration. She is based in North East Fife and explores in her work the ways in which human beings embrace the external influences in their lives. Moyra’s most recent work is influenced by patterns in Lewisian Gneiss (the oldest rock on Earth, formed some 5 million years ago) and is found in the North West coast of Scotland. The process she uses of Naked Raku is very intricate and detailed, it requires considerable control and skill in the process. Find out more about Moyra Stewart here. Mizuyo Yamashita - Mizuyo is originally from Japan, a country with such a wonderful tradition of ceramics. She moved to London in 2000 and after an initial period of doing slip-cast and hand-built work, she began throwing on the wheel in 2013. Mizuyo’s work is functional and her interest lies in the relationship between the shape and design of tableware with food culture, primarily in the UK and Japan. Inspiration for Mizuyo’s work comes from archeological artefacts, everyday products, the form in nature as well as the materials and processes in ceramics. Find out more about Mizuyo Yamashita here. At Ceramics in the City a number of potters previously featured on Craft Editions were also present; including Tamsin Arrowsmith-Brown and Justine Allison. Find out more about the Geffrye Museum here.